Photograph of the Secunderabad Club, from the Macnabb Collection (Col James Henry Erskine Reid): Album of Indian views, taken in c.1902-03. The cantonment at Secunderabad was laid out in 1806 for the British Subsidiary Force and the Secunderabad Club became a local landmark here. The Club was established on April 26, 1878 and was originally known as the Secunderabad Public Rooms. It was renamed the Secunderabad Garrison Club, the Secunderabad Gymkhana Club and the United Services Club. It became the Secunderabad Club in March 1903. 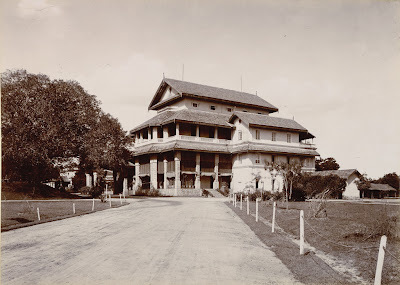 The Salar Jungs initially used it as a rest house, whenever they came to the cantonment to meet the visiting Viceroy and the British Resident.